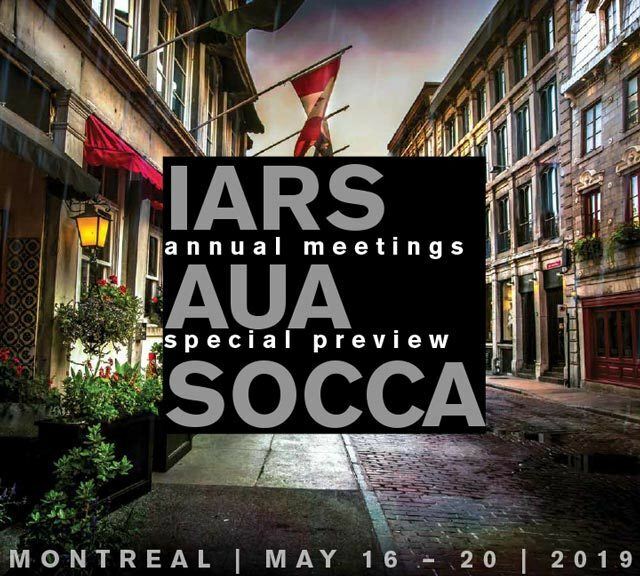 We are no longer accepting Abstracts for the IARS, AUA or SOCCA 2019 Annual Meetings. Below please find information about Session dates and times, Poster Presenters, Poster Session Moderators, and Abstract Awards. For all three meetings, during Open Poster Viewing times all are welcome. AUA and SOCCA 2019 Annual Meetings will include Moderated Poster Discussion Sessions. These sessions include a moderator as well as 4-6 poster presenters – we encourage all attendees to come listen and ask questions. The IARS Annual Meeting includes Poster Sessions. During these times, the presenting author will be available to answer questions and discuss his or her research. Download Poster Presentation Guidelines here. e-Posters provide presenters with an additional opportunity to showcase their research. e-Posters will be available for viewing throughout the Annual Meetings. Call4Posters™ is the preferred poster printing partner for IARS, AUA and SOCCA 2019 Poster Printing Service. Call4Posters™ is the simple and most convenient way to print your poster and pick it up on-site at the meeting. Please read through the Moderator Guidelines, AM19_Poster_Moderator_Guidelines. Two Junior Faculty Travel Awards will be awarded to the author of the best abstract in the area of pediatric anesthesia or perioperative medicine, submitted by an early-stage academic anesthesiologists. Applicants must be within the first six years of faculty appointment at the instructor or assistant professor level. The awardees will each receive a $500 prize and will present their work in the Scientific Advisory Board Oral Session. Two Junior Faculty Research Awards will be awarded to authors of highly-scored abstracts, who are early-stage academic anesthesiologists within the first six years of faculty appointment at the instructor or assistant professor level. Awardees will receive a plaque and will present their work in the Scientific Advisory Board Oral Session. Clinical Research, Basic Science and Scholar Abstract are the three areas of focus for the Kosaka Awards. The top presenter in each category will be awarded $500, and 30 finalists will be awarded $50. The Kosaka Best of Meeting Abstract Awards Session is supported by the Japan Society for Clinical Anesthesia (JSCA) and the International Anesthesia Research Society (IARS). The Margaret Wood Resident Research Award will be awarded to the author of the best abstract submitted by a resident or fellow. The awardee will receive a $1,000 prize and will present their work in the Scientific Advisory Board Oral Session. Two Resident Travel Awards will be awarded to the resident or fellow authors of highly scored abstracts. Awardees will receive a $1,000 and will present their work in the Scientific Advisory Board Oral Session. This award is presented to the individual whose research exemplifies the SOCCA’s mission. The recipient will receive a $1,000 travel stipend and one night’s stay at the Fairmont The Queen Elizabeth hotel during the award presentation. A first and second runner-up will also be selected to present their research during this session.